There’s nothing better than crowding around a well decorated Christmas tree with your family and friends. Sipping hot chocolate and eating candy canes. Wrapping presents to put underneath it. Decorating the tree is also something very special. I’m sure you can imagine your own Christmas trees growing up. Christmas is a very magical time of the year. Unless, you’re on your own for the first time. Or, you don’t know how to decorate a tree because you’re lacking ornaments. The Christmas spirit isn’t about the decorations and the ornaments. But, a nicely decorated tree can make you feel at home, or more comfortable. If you’re having trouble decorating your tree, then try using recyclable materials. 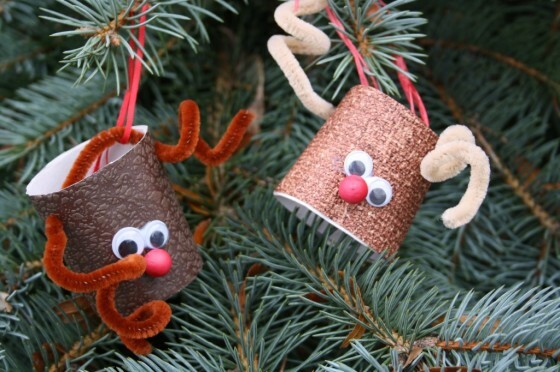 I’m going to show you some fun DIY ornaments you can make out of recyclable materials. Rudolph the red nose reindeer is a symbol of Christmas time. You can make Christmas tree ornaments that look just like Rudolph. First, you’ll need to gather a few materials. Now, you should cut a toilet paper roll in half. Next, cover the toilet paper roll in the paper. Use the hot glue gun to fasten the paper down. Then, glue 2 googly eyes onto the roll. Next, glue the red ball to the reindeer’s face, just below the eyes. Trust your judgement with placement. Twist 2 pipe cleaners (separately) so that they’re swirly. Glue them to the toilet paper roll so that they look like antlers. 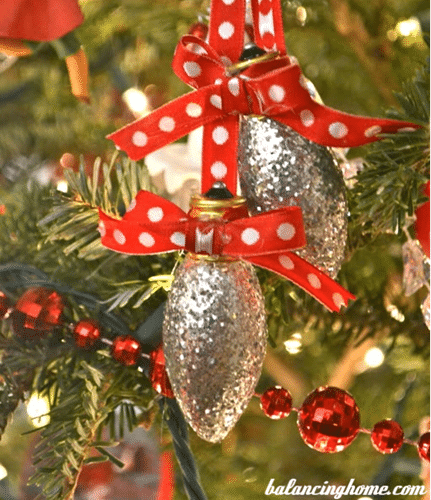 Lastly, glue the ribbon to the roll so that it can be hung on the tree. Like I said, this ornament made out of recyclable materials is almost too easy to make! First, take two glass bottle caps. The kind that are rigid on the edges. Glue the rigid sides together. They should make a “ball” like shape. Next, weave some string into the top of the bottle caps. Basically, the string should be able to hold the ornament on the Christmas tree. Once you’ve glued the string to the bottle caps, you will have a Christmas ornament made out of recyclable materials. The short answer is, yes! If you have a bunch of old CD’s lying around, then there’s something creative that you can do with them. First, decide what you want your design to be. Do you want to make a Christmas tree? Or, do you want to make the CD into a gingerbread man? Once you’ve decided what you want to make, then you can make it. It would be wise to draw the shape before you cut it out. Also, it may be difficult to cut the CD’s, so make sure you have enough to spare. Just in case it takes you a few failures to get it right. Next, cut out the design. Try using scissors, first. If that doesn’t work, then you can use a sharp knife or a saw. Next, glue ribbon to the CD so that it can be hung on the tree. Have your ever wondered what to do with all those empty liter sized soda bottles after your Christmas party? Well, I’ve got just the thing! You’ll need a couple of supplies. First, but the bottom part of the bottle off. Yes, the part that has “legs”. Next, paint a snowflake design on the bottom part that’s been removed. Then, glue both ends of a ribbon. Place the glued sides to the top of the snowflake. That way your ornament can hang on the tree. There are two ways to create recycled paper stockings. The first way requires you to sew paper together. The second way to makes these is to glue papers together. Both start in the same spot. You need to cut a stocking shape out of the old pieces of paper. Next, you can either sew or glue them together. Then, you should glue the snowflakes or other materials to the top of the stocking. Once that’s done, you should glue two ends of string or ribbon to the top of the stocking. Now, it’s ready to be hung up on your tree or fire place! First, paint the CD white because snowmen are white. Next, wrinkle the orange paper into a cone shape. Then, stick it through the hole of the CD and glue what you can. After that, glue 2 black buttons to the CD so that they’ll be the snowman’s eyes. Next, glue the black beans to the CD so that they make a mouth for the snowman. Lastly, put the string through the CD hole and tie the ends so that the ornament can hang. Or, you can glue the string’s ends to the unpainted side of the CD. Do you have old mason jars lying around? If you do, then this is a great craft for you! You will need a mason jar lid, paint, glue, and string. There will be a lot of freedom with this particular ornament. You can paint a snowman or an elf. Or, you can paint any Christmas scene that your heart desires. First, you should paint what you’d like to on the lid of the mason jar. Next, glue string to the mason jar lid. You can wrap the string or ribbon around the lid for support, or you can glue it to the top and leave it at that. Either way, just make sure that your ornament can be hung proudly on your Christmas tree. This craft will require some materials that will get messy. If you don’t like the mess, then you should find an alternative decoration or material. First, put glue all around the light bulb. Next, sprinkle glitter onto the glue. Since glitter is the messiest art supply, you should have something underneath the light bulb to catch the glitter. Also, if you dislike glitter, then you can wrap the light bulb in sparkling paper. Next, let the glitter and glue dry. Lastly, wrap ribbon the top of the light bulb and tie it into a bow. Then, glue ribbon to the light bulb so that it can hang on your Christmas tree. Make sure that the light bulb is dead before putting the paper on it. You wouldn’t want to burn the paper. You can use Popsicle sticks and buttons to make this creative Christmas ornament. First, glue 3 Popsicle sticks together. Stack the sticks on top of each other. Spread them out so that they make a star or snowflake shape. Next, glue white buttons onto the visible parts of each Popsicle stick. You can use clear buttons or tans buttons. Basically, you can use whatever colored buttons you would like. Next, glue string to the unbuttoned side of the Popsicle sticks. Glue the string so that you can hang the ornament on your Christmas tree. One of the easiest ways that you can help the environment is to recycle. There are so many unique ways to recycle. You can sort materials. Or, you can craft amazing holiday decorations out of them. It’s important that we do anything that we can to eliminate waste. If we can reduce the trash that gets thrown out, then we can save our environment. Using recyclable materials to make decorations that you can reuse year after year is a great way to make sure the materials don’t get thrown away. Also, it’s an ideal way to make sure that these supplies don’t end up in a landfill. Why bother buying “new” materials when you can find creative ways to use what you already have. You’ll save money and time! In conclusion, there are a lot of fun ways that you can use recyclable materials to make Christmas ornaments. You can make everything from snowmen to stockings. They’ll look amazing on your tree and you can brag to your family and friends about how crafty you are. If you’re not going to do it to help the environment, then do it for the bragging rights!